1. 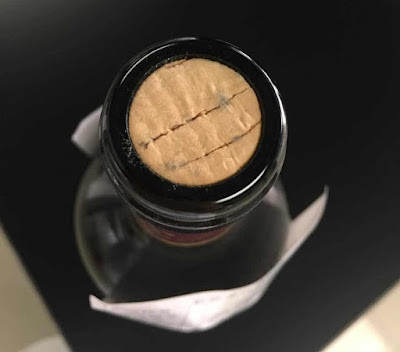 Why the fissures or cracks on the cork? It is a young vintage (2013), recently bottled (2015), and therefore the cork should be in excellent conditions, so why the fissures/cracks? Nowadays, finding bad quality cork is quite rare as quality controls at the factories and sampling by the buyers prior final selection are more rigorous and consistent than before. Although, it can still happen and surprisingly more often than we think. One of the main reasons is in my opinion due to supply and demand. 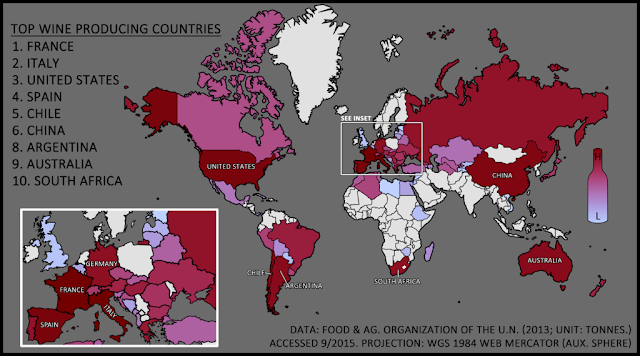 Out of the 195 recognized independent countries in the world, more than 72 countries are producing their own wines as of 2014 (see the map below for reference and related wikipedia article), against less than 50 only about 30 years ago. Some people even refer to about 120 wine producing countries at present, but those at the bottom of the list are marginals, only the top 40 are major players in terms of production. Interestingly enough, you may realize that the wikipedia article and the map below do not show some countries that also produce wine (some for decades too) like: India, South Korea, Thailand, Vietnam, and a few more. Although, a trend for plastic corks and screw capsules developed in the late 90s and 2000s after a major crisis of tainted cork (*), the 2010s saw the comeback of real cork due to its natural and environment friendly benefits. (*) Back in the late 80s and early to mid 90s, many renown wineries in Bordeaux (and other regions of France and the rest of the world) were found with a major problem of tainted cork (or cork taint, often referred to as TCA, resulting in "corked" wine) occurring due to either chlorine based chemicals used to clean/bleach/disinfect the cork, thus imparting the cork quality, and/or poor cellar hygiene. At the cork factories, where chlorine based bleaching/disinfecting products are (or were especially in the 80s and 90s) used to treat the cork as part of its production. In wineries, where damp surfaces and chlorine-based cleaning products are (or were) commonplaces. Phenols can be found in barrels, wooden pallets, wood beams and cardboard. If not rapidly detected TCA can spread and eventually taint the wines via contaminated corks. However, while cork quality has improved drastically over the last 15 years, as wine producing countries rise, so does the supply and thus the demand, generating a major problem in the production and supply of cork, and consequently its quality. The main factor being the increase of cork harvests and diminution of time between the harvests. The cork may have dried out due to bad storage conditions, right after bottling, while stored at the Chateau (property) or at a Negociant's warehouse, or any other facilities that may not necessarily be well adapted or designed to keep wines in an ideal environment and climate. (Personally, I have seen and experienced many wines being very badly stored in my 25 years career as a Sommelier-Wine Buyer, sometimes even at prestigious Chateaux and renown Negociants.. but this could be the subject of another post). - Or if not during storage prior been shipped, the cork could have dried out during transportation, for example if the container was not reefer and the wine was shipped during hot weather, Non refrigerated container can get really hot inside during the journey to the final destination, which could last for several weeks (e.g. 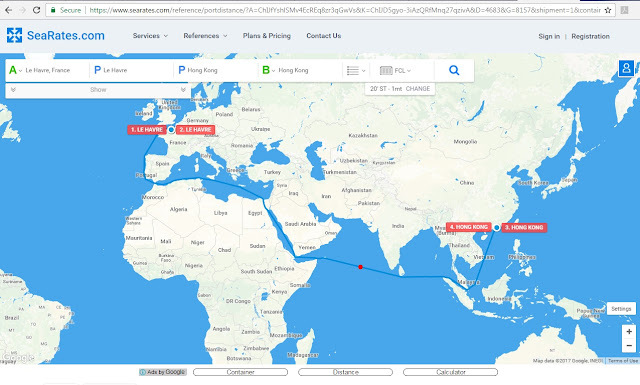 as per www.SeaRates.com, shipping time between "Le Havre, France" to "Hong Kong" takes about a month).